We’re used to coffee being branded by style or by region, or even by the farm of origin – but I think this is the first time that I’ve had a coffee simply branded with the name of the man who grew it. Raul Mamani‘s family smallholding is in the Tampbopata region of Peru, close to the Bolivian border. 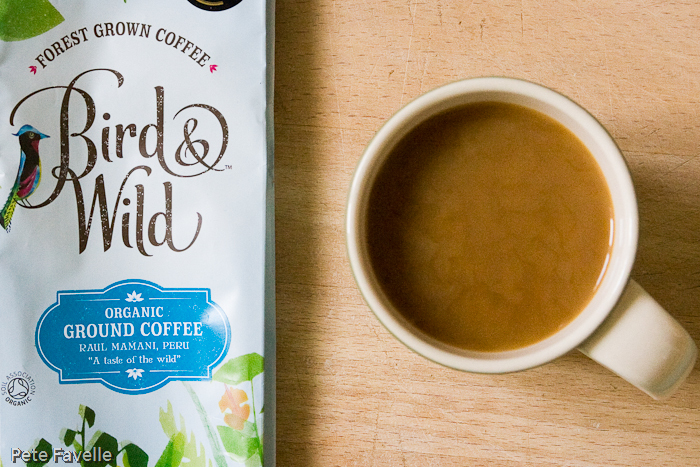 As with Bird & Wild‘s other coffee, this is certified Bird Friendly and Organic and is grown under the shade of the surrounding rainforest. The grounds have a rich aroma, toffee blending with sweet, ripe oranges while underneath lurks a sharp, citrus acidity and just a hint of sun-parched wood. Brewed, the acidity is more pronounced – more exotic fruits appear, melon and perhaps even a touch of mango. The richness remains, but the sweetness is reduced. In the mouth, it’s initially almost fruity; gently honey sweet with soft, slightly under-ripened strawberries giving a nicely filling body to the coffee. The acidity only really kicks in later, continuing to build even after you’ve swallowed and leaving a lingering dryness. I’m torn by this coffee; sometimes when I drink it that acidic bite in the finish is just too overwhelming and other times it just feels like the perfect finish. It swings from a three star coffee to a four star one depending on my mood, which averages out to 3.5 stars.